Bridget Hughes and her hat, before it went missing. The story of Bridget Hughes' missing hat struck a chord with many. It was the floppy hat her mom wore years ago when she had breast cancer and was having chemotherapy. 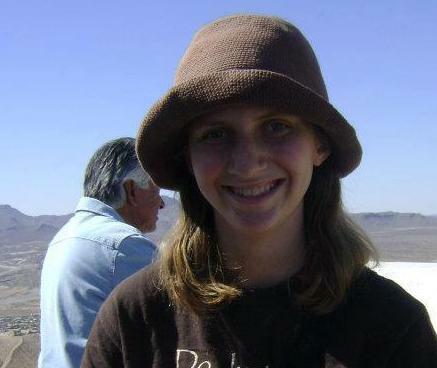 Mom died when Bridget, now a volunteer preschool teacher in New Mexico, was seven. The hat went missing last month at Phoenix Sky Harbor International Airport. We, and many others around the Web, reported about Bridget's Facebook post asking for help in finding it. Her message got passed around the Web and landed her on news shows and websites across the nation. "I emailed Sky Harbor this morning. They are well aware of the fact the hat is missing. They have done a thorough job searching the airport multiple times. I am forever grateful to them. "In the email, I told them to stop looking for the hat. I did this for two reasons: 1. I firmly believe that it is no longer in Phoenix Sky Harbor Airport; 2. I have, from the beginning of this going viral, felt uncomfortable with the hype. "The hat IS important to me. This IS a good story. Honestly though, there are so many people in this world whose stories deserve to be told. We've got bigger fish to fry than a lost hat. "This does NOT mean I am giving up hope the hat will be found. I simply think that demanding the airport search more is unreasonable. They have done all they can. The rest is up to God."